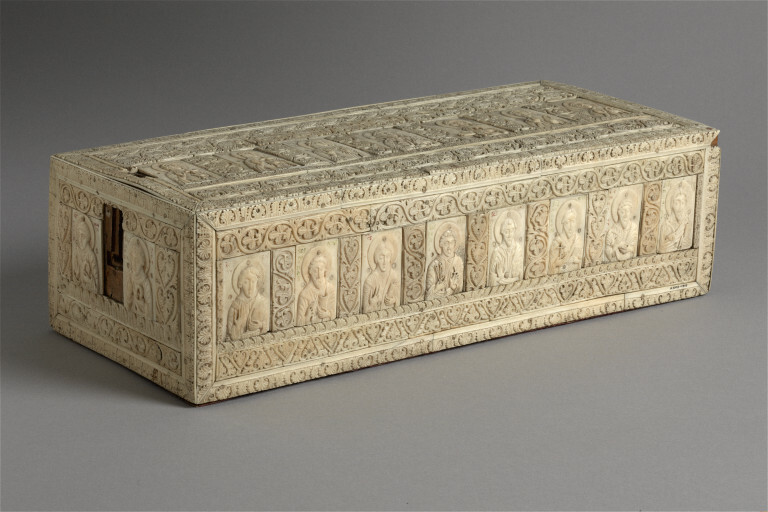 This casket, probably based on an imported example, has adapted the structure and decoration of its Byzantine model to incorporate locally revered saints. Chrysanthus and Darias, who appear in prominent positions on the lid, were especially honoured in the Apulia region of Italy. 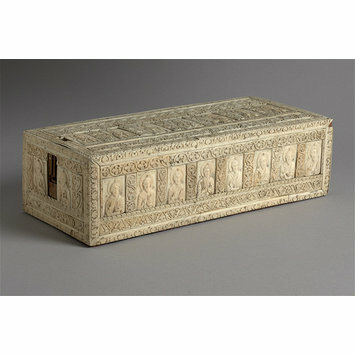 There can be no doubt that the box served as reliquary casket. On the front Saints Philip, Thomas, John the Evangelist, Peter, Paul, Andrew, Bartholomew and James the Greater; on the back Saints Stephen, Mark, Jude, Matthew, James the Less, Simon, Matthias and Luke; on one end Pope Gregory the Great is flanked by Saints Nereus, Gregory and Achilles, and on the other Saints Justus and Pankratius (one plaque is missing). All the male martyr Saints are shown with the martyr's crown or wreath, and St Peter is holding two keys, the wards of which spell out his name in monogram form. Nearly all the plaques are fixed to the core with four bone pins. Bequeathed by George Salting in 1910. Historical significance: A Roman or Apulian provenance has been suggested on the basis of the iconography. All inscriptions are in Latin, the martyr Saints are Italian, and with two exception Roman. Saints Chrysanthus and Darias were especially honoured at Oria in Apulia, and here they are seen in a prominent position on the lid of the box flanking the Virgin and Christ. The borders relate to foliate scroll decoration on the doorway of S. Nicola e Cataldo in Lecce and the figures themselves are very close to those seen on the tympanum of the North doorway of the Cathedral of Troia, dated to the first quarter of the twelfth century. Several features indicate Byzantine influence, and this casket was probably produced in imitation of an imported Byzantine example. P. Williamson, The Medieval Treasury, London, pp. 160-61. Dell'Acqua, Francesca; Cutler, Anthony; Kessler, Herbert L.; Shalem, Avinoam; Wolf, Gerhard, eds. The Salerno Ivories: Objects, Histories, Contexts, Berlin, 2016, p.103.